Want to live in a New Atlanta townhome community in an enclave of only 44 units? This John Wieland built neighborhood, of classic style properties with views of the Chattahoochee River National Recreation area, is a great place to call home. Located in the City of Atlanta Georgia 30339. Most of these townhomes, at time of post, have 3 to 4 bedrooms and 3.5 to 4.5 bathrooms and 2 car garages. List prices, at time of post as listed in the Georgia MLS, are between $819,900 to $939,900. 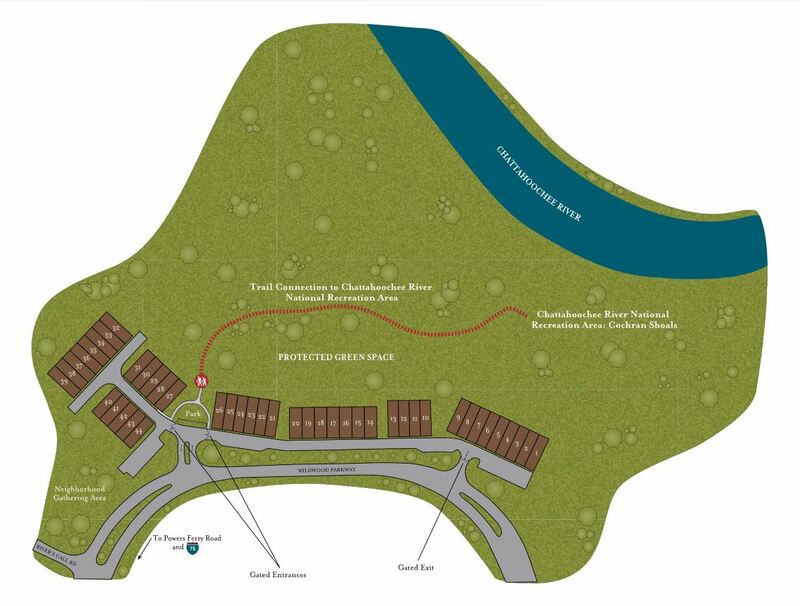 Amenities in the community include a gated entrance, a neighborhood trail that will connect directly into the park (see map below). HOA fees, at time of post, are $4,000.00 a year with an initiation fee of $2,000.00. Location-Directions: Take 75N to Windy Hill; Left on Powers Ferry to Wildwood Parkway; turn Right; go past Rivers Call entrance; Abbington At Wildwood neighborhood is on the left. Conveniently located access to I-75 or I-285.